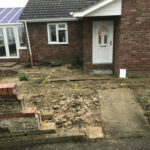 We had been contacted by our customer to look at their driveway; as they needed something more suitable for their needs. 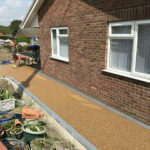 The customer uses a wheel chair and needs a surface area that is wheel chair access friendly, low maintenance and fully permeable. 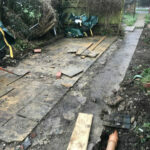 We went on site and excavated all of the old driveway and pathway. 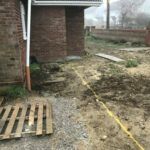 This was then removed from site and left a clear canvas to work on. 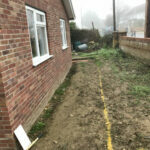 We then laid a terram on the bottom of the foundations. 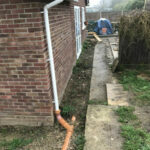 This was done to create a barrier between the sub base and the new type 1 granite base. 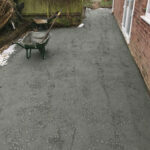 The type 1 granite base was then laid over the terram, this was laid at 150 – 200mm and compacted down. 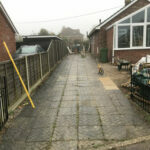 We then edged all of the paths and driveway, this was done with charcoal block sets laid on concrete. 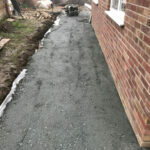 Once this was completed we then laid a 10mm open textured tarmac base at a depth of 50mm. 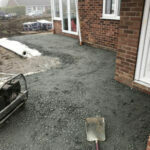 This gives the resin a good base to be bound to. 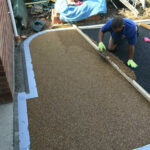 Then we hand trailed amber gold aggregate resin bound at 18mm thickness. 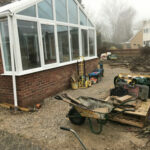 Another job successfully completed and a very happy customers for Simons Landscaping. 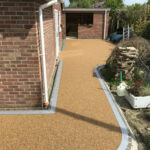 If you would like to know more about our resin bound surfaces, then please make an enquiry through our email: [email protected] or give us a call on: 01508 470674. 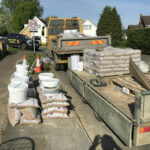 This entry was posted in Landscaping Case Studies, Landscaping Services and tagged Driveway, Resin, Resin bound, Resin bound driveway, Resurface on 19th May 2018 by Harry Timson.